The garbage that Canadian banks feed us is simply unbelievable. The above quote is the first sentence from a recent BMO report (go to page 6). By comparing apples to oranges the report tries really hard to paint a picture of a soft outcome. It says a 20% correction is unlikely under normal economic conditions. Incomes have remained the same since 1997 while condos and freeholds almost doubled in price (adjusted for inflation). 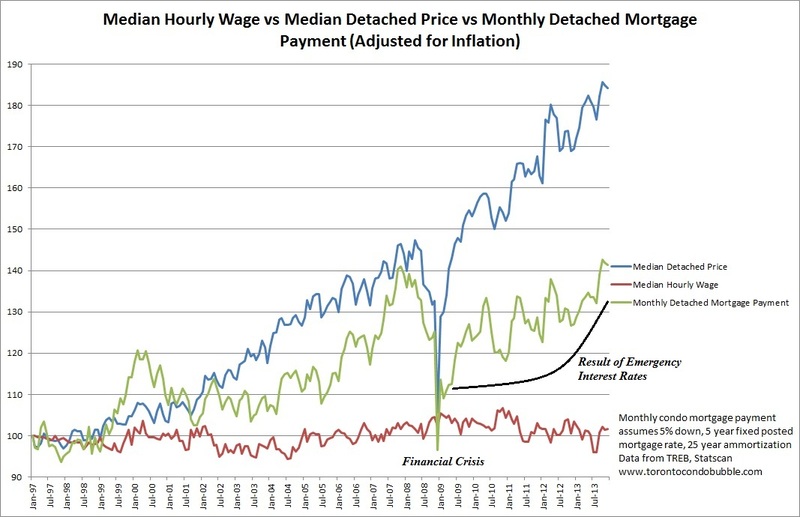 Now if you're like me and believe that inflation is understated then the above picture is even worse. Emergency interest rates will certainly help to keep things afloat for now. How long will that last? Who knows. Things can still turn south whether interest rates rise or not. Here is the same chart as above for the detached market segment. 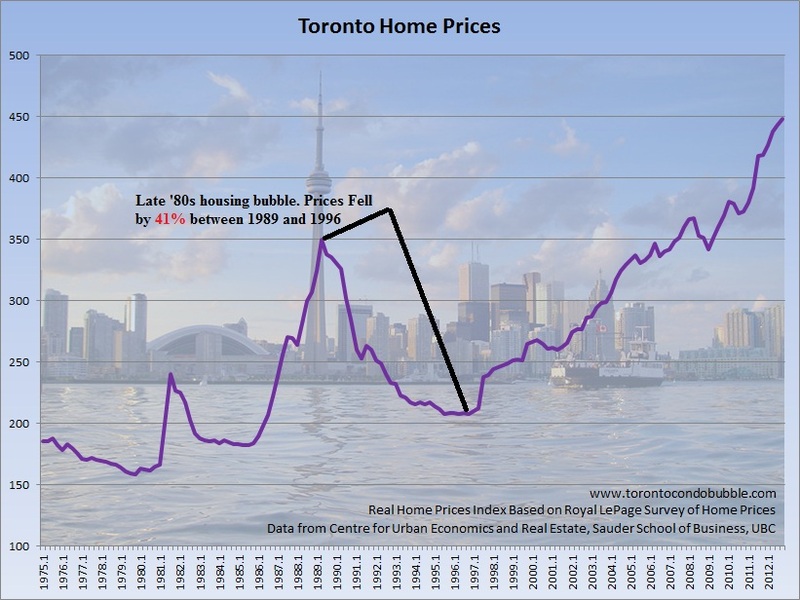 Speaking of detached home prices, the average price for SFH in the City of Toronto went up by almost 20% compared to a year earlier. Yes, you've read it right - 20%. There's no bubble here - it's just a scarcity of homes. But why did the SFH market segment crash the most (by 25%) in the midst of the financial crisis? Weird. 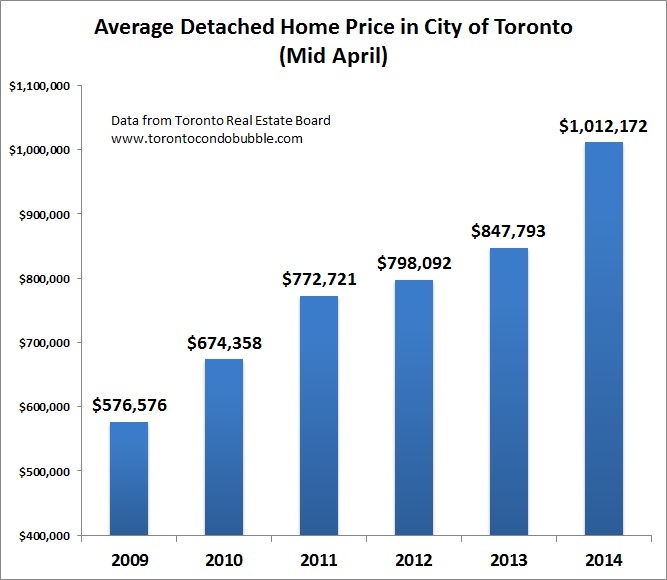 The average detached home price in the City of Toronto hit $1,012,172 in mid-April 2014. Woohoo! Just keep in mind that when you buy a property in the 416 it is likely to be old and in need of repair. Be ready to pay $15,000 when your basement gets flooded. Also don't discount the possibility of paying the same amount all over again because contractors messed up the repairs and your basement flooded again. True story here! And that's the essence of home ownership - a money pit! 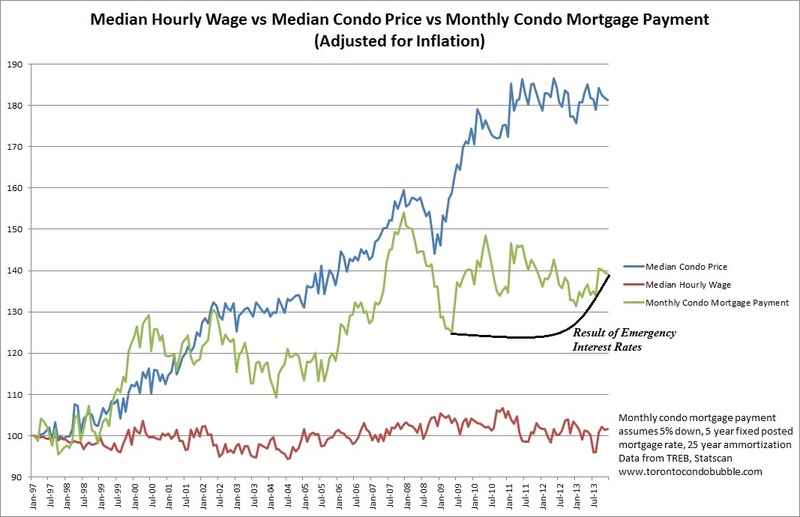 Remove the price appreciation cycles and less people would be willing to pursue the home ownership venture. But hey, if you don't want to deal with leaky basements you can always buy a condo. That will provide you with peace of mind - at least in theory. You see those maintenance fees - they tend to go up and sometimes by a lot. A 10% increase in one year is not uncommon. And don't forget about those horror stories with special assessments. You've been warned. But that's okay as you don't plan to live in the condo you just bought - it's an investment. 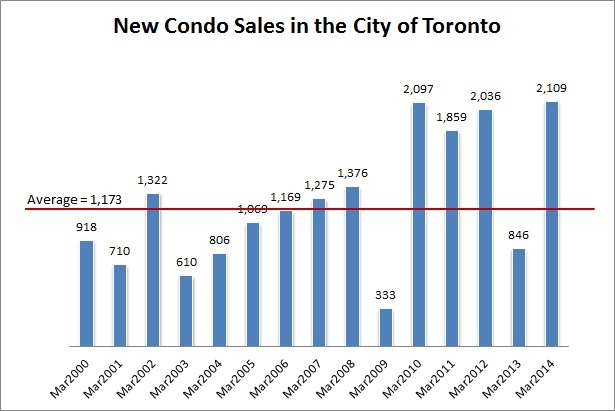 Last March 2109 pre-construction condos were bought by investors in the City of Toronto. The average price of those condos was $436,900. I say "bought by investors" because why would you pay $436,900 for an unbuilt unit when you can buy a resale condo in the city which averaged $386,874 in mid-April. Of course twice as many believers bought a pre-construction unit in March 2014 versus a year earlier because they believe that condo prices will go up. And, if anything, they could always rent those condos in the future. 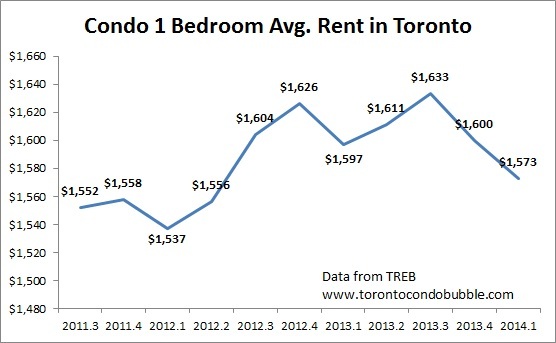 One-bedroom condo rents continued to decline during the first quarter of 2014 as the number of condos for rent went up by 27% compared to a year ago. One-bedroom units represent approximately 60% of total condos available for rent. Average rent for a one-bedroom condo declined by 1.6%. Condo rents are going down because the number of new units available for lease is going up. 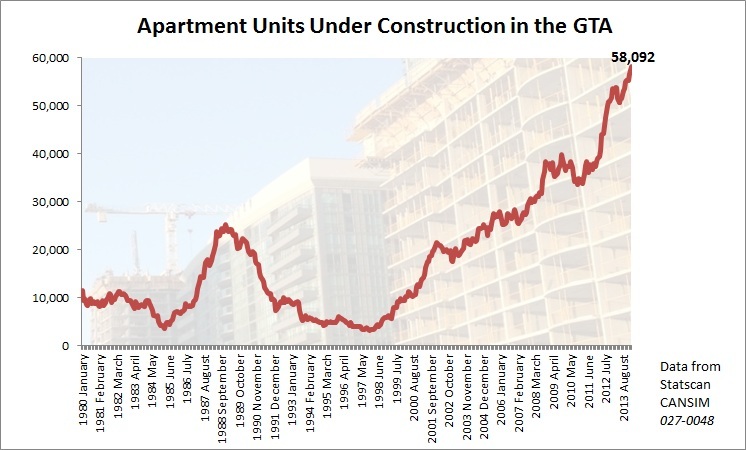 This past February we hit a record number of 58,092 apartments under construction in the GTA. About 80% of them were in the City of Toronto. Once those hit the market expect condo rents to go down even more. If we adjust for population and employment in the GTA, we get the graph below. Two important points here. 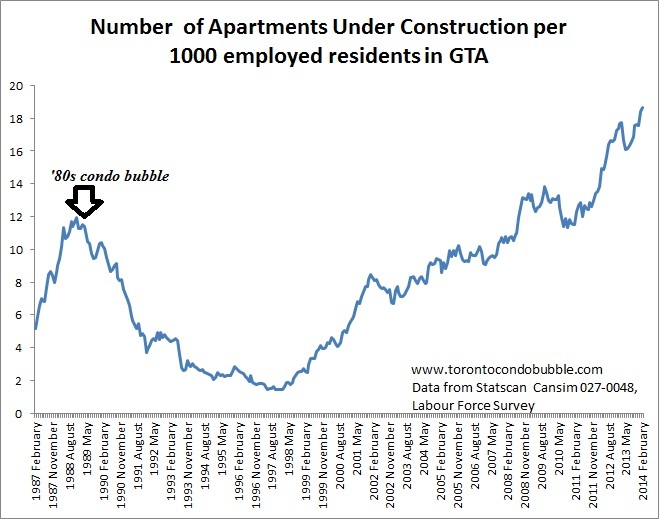 First, we are currently building more condos than during the condo bubble in late '80s. Secondly, the increase in construction, until recently, wasn't as fast as during late '80s bubble. What this might mean is that the eventual fall in prices will not be as sudden as two decades ago. The late '80s bubble was a classic textbook example of a housing bubble. This time the number of units under construction rose much more gradually. So did the price increases. However, if we look at the Netherlands, where prices rose steadily (about 5% per year) for a decade, that still didn't prevent the housing crash. 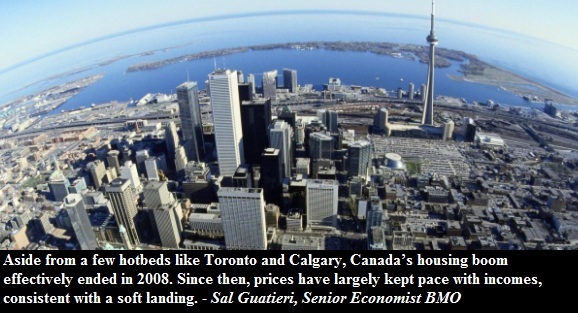 Point being, even with gradual price increases you may still experience a housing crash.